Do you know everything there is to know about the history of diamonds? There is much to know about the history of diamonds in South Africa. Diamonds were formed over 3 billion years ago, deep within the Earth’s crust. The first diamond sighting was believed to have occurred in India around 2500BC as alluvial deposits along the Penner, Krishna and Godavari rivers. Diamond cutting was established as an industry in 1330 and was believed to have started in Venice, Rome. In 1447, the first diamond was given as an engagement ring by the Archduke Maxmillian of Austria when he proposed to his wife-to-be, Mary of Burgundy. The story of South African diamonds started when the first diamond was discovered in 1867 by 15-year-old Erasmus Jacobs, on the Orange River. This 21.24 carat diamond was named the Eureka diamond, and is the single most important diamond in the history of South Africa. 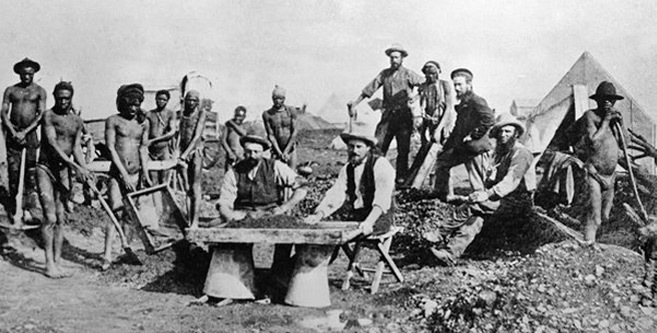 The discovery of this diamond led to the Kimberley Rush that played an integral part in transforming South African into a leading industrial nation. More than 22 million tons of earth was removed from what is now known as “The Big Hole” in Kimberley and approximately three tonnes of diamonds were removed. Today, South Africa remains a leading diamond producer. Diamonds are made up of pure carbon atoms, deep in the ground, exposed to intense heat and pressure over billions of years. The atomic bonds in diamonds are very strong which give diamonds their hardness. Diamonds are forced to the surface of the earth through volcanic eruptions. Due to the extreme environment that is required for them to form, they are extremely rare, making them even more valuable and sought after. Diamonds have been popular for many years and are seen as symbols of love, beauty, power and wealth. The world of diamond is definately not dull, there are many interesting facts about diamonds that will amaze you. Before purchasing a diamond, we recommend reading about how diamonds are graded according to the 4Cs – cut, colour, clarity and carat weight. This will help you make an informed and educated decision as to the best diamond for you.